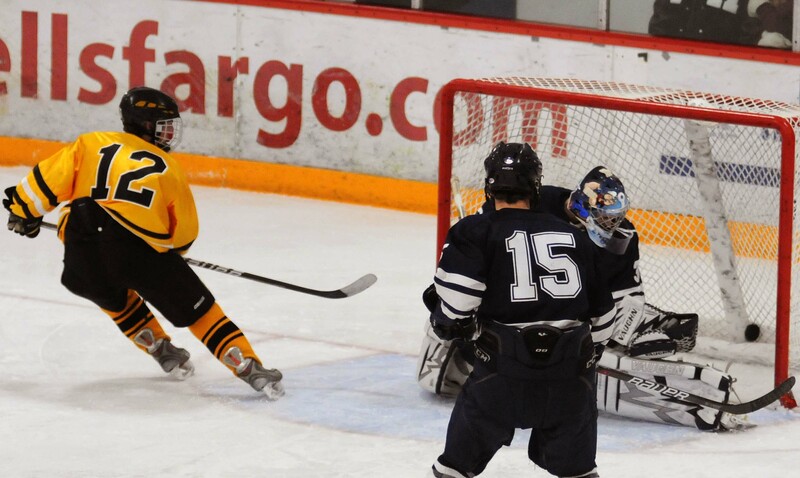 Matching up against Hibbing’s Adam Johnson is an assignment that gives most players nightmares. The Minnesota-Duluth recruit has remarkable hands, great speed and an incredible nose of the net. For Duluth Marshall’s Jake Bushey and Judd Peterson, the challenge is something they thrive on. The two were on the ice for almost every shift Johnson took Tuesday night, and, other than the game's first several minutes, kept him away from the net in a 5-2 triumph at Mars Lakeview Arena. Most of Duluth Marshall’s success was thanks to the play of the two Topper stars – Peterson had two goals and an assist, Bushey had two helpers and both players were great in all three zones. But their shutdown play against the top-line of the Jackets was the biggest difference. While the defensive effort is a good sign for a young team after a rough performance in a 7-5 loss to No.-1 ranked Breck (Class 1A) on Saturday, Nov. 26, Flaherty is quick to point out that there is still plenty for the Hilltoppers to work on. Judd Peterson scored two goals, Anthony Miller had three assists and Christian Coffman stopped 22 shots as Duluth Marshall beat Section 7A rival Hibbing, 5-2, on Tuesday, Nov. 29, at Mars Lakeview Arena in Duluth. After Hibbing built a 2-0 lead on first-period goals by Max Butler and Joe Anderson, the Hilltoppers found their game. Michael Damberg cut the lead in half late in the opening period when he took a pass from Miller on a two-on-one and snuck a backhander past Hibbing goalie Tyler Carlson. Even though Marshall was trailing after the first, it was clear that they were starting to take control. Steve Long tied it 2 minutes, 16 seconds into the second when he split the Hibbing defense and found an opening low on the blocker said. Peterson blasted a power play shot through Carlson a few minutes later and, just like that, the Hilltoppers were in the lead for good. Peterson and Cameron McClure added two more insurance goals for Duluth Marshall in the final period, leading to a lot of after-the-whistle pushing and shoving late in the contest. Marshall’s Kris McKinzie and Jake Bushey had two assists each, while Peterson and Matt Klassen added single assists for the Toppers, who improved to 2-1 on the season. Adam Johnson, Eric Riihinen, Cole Maki and Mike Pechovnik all had an assist for the Bluejackets, who fall to 1-2-0. Carlson finished with 21 saves. Both teams are off now until Saturday. Hibbing will host Chisago Lakes; Duluth Marshall will travel to the Twin Cities to play defending state Class 1A champion St. Thomas Academy. Peterson again dazzled, scoring twice and adding an assist. Not only did he dominate on the offensive side of the puck, but he also was a huge part of Marshall’s blanketing coverage of Hibbing’s Adam Johnson. Bushey was tested against Hibbing’s top line all night, and he passed with flying colors. The big, speedy defenseman limited time and space, making it almost impossible for the Jackets to operate in the offensive zone. The sophomore had the playmaking touch, setting up three Hilltopper goals. He also showed great poise and grit for an underclassman, playing tough along the wall in both ends.